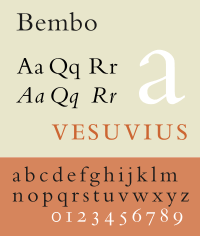 Bembo is a roman typeface that Stanley Morison revived in 1928 based on punches cut by Francesco Griffo in 1495. In Latin-script typography, roman is one of the three main kinds of historical type, alongside blackletter and italic. Roman type was modelled from a European scribal manuscript style of the 15th century, based on the pairing of inscriptional capitals used in ancient Rome with Carolingian minuscules developed in the Holy Roman Empire. During the early Renaissance, roman and italic type were used separately. Today, roman and italic type are mixed, and most typefaces are composed of an upright roman style with an associated italic or oblique style. Popular roman typefaces include Bembo, Baskerville, Caslon, Jenson, Times New Roman and Garamond. The name roman is customarily applied uncapitalized distinguishing early Italian typefaces of the Renaissance period and most subsequent upright types based on them, in contrast to Roman letters dating from classical antiquity. Look up roman in Wiktionary, the free dictionary. Bringhurst, Robert (2008), The Elements of Typographic Style (version 3.2). Vancouver: Hartley & Marks. Often referred to simply as "Bringhurst", Elements is widely respected as the current English-language authority on typographic style.